Mad Men’s Jon Hamm returns for a second year in H&R Block’s tax season efforts. The campaign, which is a fresh take on 2017’s “Get Your Taxes Won,” illustrates that “winning” at tax time means finding all the credits and deductions taxpayers are entitled to for the best outcome. Eight new broadcast spots from Fallon center on Hamm in a variety of behind-the-scenes scenarios on a film set. 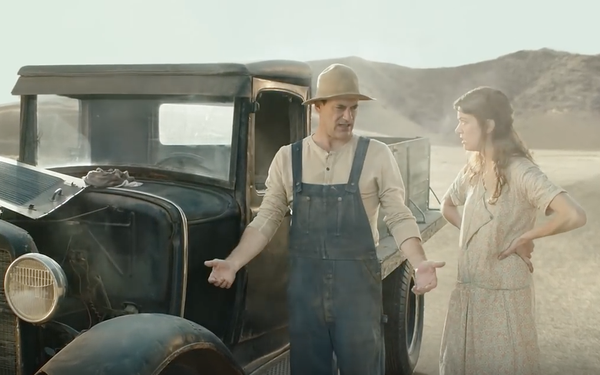 The campaign kicked off in early December with the spot “Dust Bowl” promoting the availability of H&R Block’s interest-free loan product, Refund Advance. The main campaign launches Jan. 1 with additional national broadcast buys and digital and social programming scheduled in conjunction of H&R Block’s product rollouts throughout the season. Ads will also air during the NFL playoffs, ESPN College Football Playoffs, March Madness and the Winter Olympics. The 2017 campaign was one of the financial services company’s most successful national marketing and advertising campaigns, said Kathy Collins, H&R Block’s chief marketing and strategy officer. “When we saw the early positive engagement and strong response from consumers, we made the decision right away to co-create with Jon again and he was all in,” Collins says in a release. The 2018 campaign highlights the brand, its partnership with IBM Watson, and a number of tax season products and programs. “We were able to have some fun with a somewhat serious topic and deliver the message that it really does matter how you do your taxes if you want the most money back, but in a lighthearted way,” Collins says. Taxes can be stressful for some people, and consumers should trust that their filing will be right, no matter how they choose to file their taxes, she says. With the most substantial changes to the tax code in 30 years pending to go into effect in 2018, consumers now more than ever will need to work with trusted advisors to understand how their personal tax situations will be affected. “H&R Block will be advertising the many ways we help taxpayers take advantage of every credit and deduction available to them,” Collins says.